Settling Scores: 36. What shall we tell the students? 36. What shall we tell the students? In some ways, I feel that musicology is both my job and my hobby. I’m paid to be a musicologist (or maybe I’m really paid to administer a department, but I have to teach something); I “do” musicology on the side, too. With occasional exceptions, my bedtime reading and the books I take on vacation are musicological; issues of the Music Library Association journal Notes (which always has a few articles, but is mainly filled with reviews of books, scores, and other musical media) accumulate on my desk to take when I travel. (I’ve found that Notes is perfect for travel conditions, as the fairly short items can easily be interrupted at any moment—a gate change, the refreshment cart coming down the aisle, etc.—and resumed later without really losing the thread.) Most of what shows up on this blog inevitably comes from the “hobby” side of my musicology interests; indeed, very little has actually concerned the textual materials that have been my own research focus. But this is one of my rare posts from the “job” side, straight out of the classroom. It’s not that the others don’t deal with issues that might be useful in a classroom, but I tend not to write about what I do in the classroom. In the blog I often dive deep into geeky details, but in class I seldom wade into textual waters, maybe for fear of drowning in digressions, or of scaring my students away. But there are times where a textual matter is so central—a veritable elephant in the room—that it must somehow come up in class. I have usually taught music history classes without a textbook as such, using anthologies instead—one of scores and one of primary sources. (For years I did this happily pairing the W. W. Norton survey score anthologies with the Weiss/Taruskin Music in the Western World source readings.) More recently, my approach to music major courses has changed so much that I find no text worth my students’ money, and so I have sometimes opted to make my own anthology—particularly with the easy access to public domain editions via the IMSLP. I have kept my eye on the products out there, though, so I know pretty well what I am foregoing. Source: scan of Norton Anthology of Western Music (6th ed., 2010), pp. 238–9. I know that the notation of an early edition might be unwieldy for students, but it is not so foreign as to lose them completely. (For example, here are the relevant pages of a 1679 printing of the Geneva Psalter, and a 1635 Scottish Psalmes of David in Prose in Meeter). On the strength of the maxim about the value in teaching someone to fish, I would rather have the occasional difficult source in the classroom than always predigested texts. Granted, the Norton anthologies do not generally seek out give original sources to reprint, but why re-set these here when the early printings could be such a handy teaching tool and take no more space? Enough quibble about Norton. A far larger disservice to students has been done by the competing Oxford Anthology of Western Music, three volumes conceived as an ancillary resource for the textbook version of Richard Taruskin's Oxford History of Western Music. Whatever one might say about Taruskin’s accomplishment (and many people have... including the bloggers of The Taruskin Challenge), he is a significant voice. Whether adopted or rejected, his retelling of the story of Western music will inevitably influence the classroom (and music journalists, for whom he seems to have become a one-stop shop), despite his particular interests and lacunae. If Oxford University Press has its way, Taruskin’s version will supplant all others for the next generation. My criticism in this post has to do not with Taruskin but with the companion score anthology, which was prepared by others. As far as I can tell, the editors have—understandably—resorted to public domain editions as often as possible to keep the costs down. I have no problem with this: I am convinced that you can teach effectively from any source (although some sources are better in one context than another); furthermore, in a music classroom there is no such thing as a “bad” edition, as long as we consider what precisely that edition can teach us. What frustrates me is when the editors fail to realize the value of the eccentric edition they have chosen to reprint. I will offer two examples here. Source: cropped scan of Oxford Anthology of Western Music (2nd ed., "2019" [sic! ]), Vol. 2, p. 204. The Oxford anthology reprints the old Breitkopf complete edition (although bar numbers have been added and the layout is altered to fit more systems on the page). This is a work for which no autograph manuscript survives, so that the first edition (1799) is the most authoritative source, despite the occasional likely misprint. 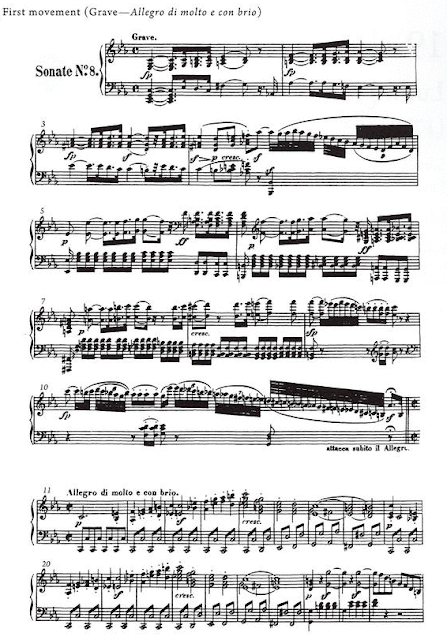 One significant aspect in which some subsequent editors have departed from the text of that first edition is the placement of the exposition repeat: is the pianist to go back to the beginning or to the Allegro di molto e con brio (b. 11)? SOURCE: bb. [11–13] cropped from the IMSLP scan of the 1799 first ed. The first edition places this repeat at b. 11. To be sure, there may be good musical reasons for wanting a reprise from the start—analogous to the Tempo I section which begins the development (b. 133)—but that is not what the first edition shows. In his edition, Jonathan Del Mar concludes “There can be no [textual] justification for taking the repeat from bar 1, as has in some circles become fashionable” (p. 26; the bracketed emendation is mine). The Oxford anthologizers have missed a chance to remark on this textual detail, and it is a good "teaching moment" lost... or at least inconvenienced, as now the instructor would have to know of this discrepancy in order to point it out, if someone in the class doesn’t notice a difference between the text on the page and a recording they might hear. 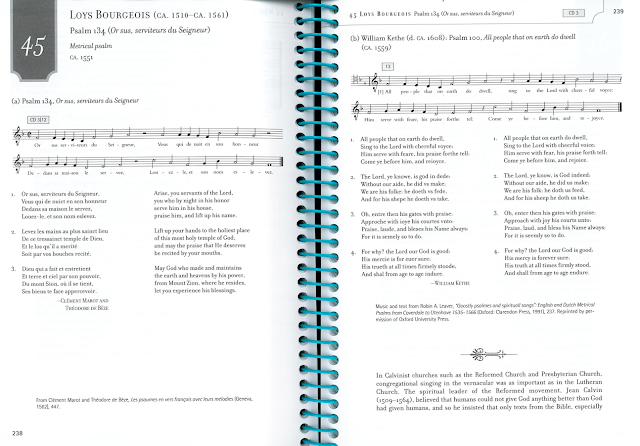 Source: cropped scan of Oxford Anthology of Western Music (2nd ed. ), Vol. 2, p. 281. SOURCE: bb. 25-28, cropped scan of 1897 Choudens piano/vocal score "Edition conforme au manuscrit de Rossini", with piano reduction credited to L. Narici; scan from IMSLP 280519. 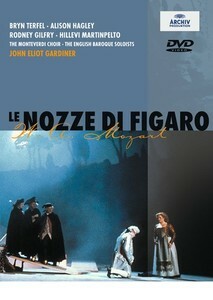 According to the critical commentary of the new WGR edition, the three-note echo appears in no authentic source of il Barbiere (1816), although Rossini had apparently previously altered the text thus when he used the same overture earlier in the year for Elisabetta, regina d’Inghilterra. (He was recycling it there from Aureliano in Palmira (1813), which had the two-note version.) 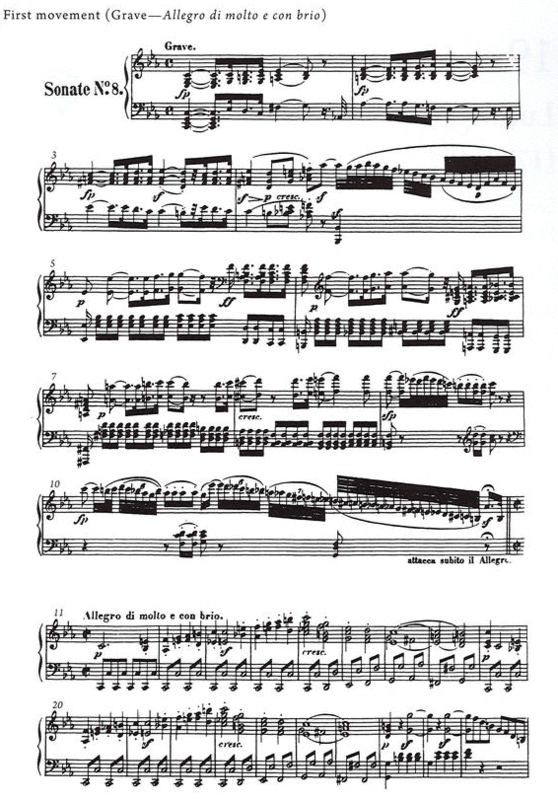 Rossini’s regularization mystifies me, as it is the lack of conformity that seems to me truly ingenious: I am struck by the way in which the omission of a single eighth-note makes the whole passage seem less cluttered, less fussy. The original is “the harder reading,” and it is no surprise that copyists would knock it back into conformity. Whatever Rossini thought in the meantime, when it shows up again in Barbiere (here) the extra pick-up is gone, and the original text is restored. But you wouldn’t know that from the Oxford anthology, where no mention of it is made at all. Do we tell the students? Perhaps these are nothing more than missed opportunities. Most troubling in the Oxford anthology is the cavalier identification of some of the sources in the first volume. 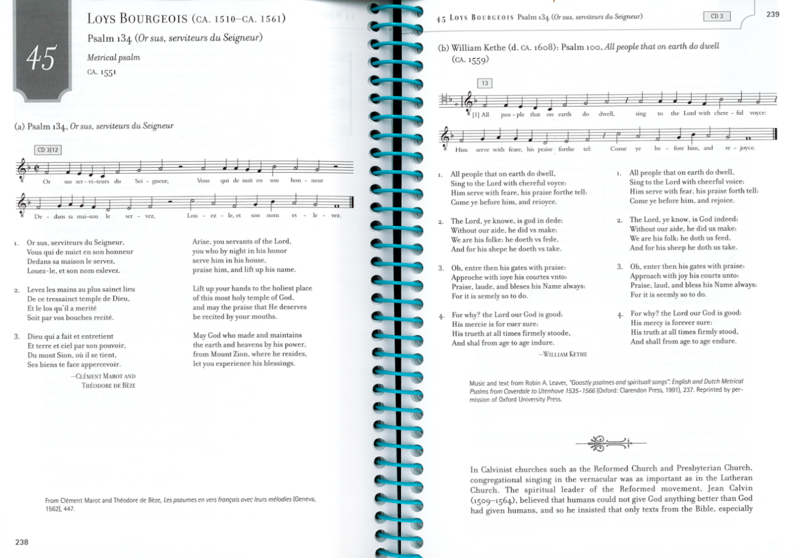 Source: cropped scan of Oxford Anthology of Western Music (2013), Vol. 1 p. 530. But it’s not like I have been a paragon of textual transparency in the classroom. For years I have had indistinct qualms about an example I have taught in which there is a huge textual departure which I never mention to my students. I have regularly used the last portion of Act III of Le nozze di Figaro in my core-curriculum music course (the sort of course that has generally supplanted “appreciation” courses). Even though the bit of the act I assign in the course starts just before the dictation duet (“Canzonetta sull'aria”), I have found it useful to screen the whole of Act III for the class. It takes about 40 minutes, and so with a few minutes of contextualizing, and occasionally interrupting to make some comment about form or technique, it just fits in a 50-minute period. The students always seem to enjoy it. What I have always failed to tell my students, however, is that Gardiner modifies Mozart’s sequence in Act III to accord with a hypothesis of Christopher Raeburn and Robert Moberly—essentially moving the Countess’s aria to before the legal proceedings. This scheme puts two soliloquy scenes back to back and removes altogether any solo numbers from the second half of the act. Nonetheless, I like the pacing, and I think it works very well in that production. I remember once hearing a senior scholar respond to a graduate student’s idea, “Well, that's something you might tell undergraduates.” I hated that. I understood what he (sic) meant—something like “that is a hideously oversimplified explanation, but it is pedagogically useful as it is easily understood and would allow you to move on to other material.” I don’t ever want to condescend to my students like that. But I also don’t want to obscure the subject by belaboring them with my textual hobby. While it is fun to have a hobby and a job that so closely intertwine, I’ve got to keep the two distinct enough that the everyone in the room is aware if I am momentarily digressing (or transgressing, really) into the hobby territory. Such transgressions can be valuable—as sometimes I have had to see someone being passionate about something in order to understand why it matters. And I don’t mind being geeky if my students can understand why I care about something. Actually, I just don’t mind being geeky. My conclusion is so trite as to not need saying, perhaps, to anyone but me: What shall we tell the students? Whatever works. Labels: anthologies, Beethoven, John Eliot Gardiner, Mozart, Oxford University Press, pedagogy, Rossini, variant readings, W. W. Norton & Co.